We print and process orders during regular working hours, Monday to Friday. Orders are printed, packed and sent approximately 2-3 days being received (except on weekends). Delivery times will vary depending on the USPS but we find most orders arrive within a week to 10 working days. *** The exception to this is our woven sew on labels which require a 3 step process on the old fashioned looms. So please be patient and allow an extra week if you are after these labels in particular. How do you deliver an order? We use the USPS to send out your order so it will come straight to your letterbox. 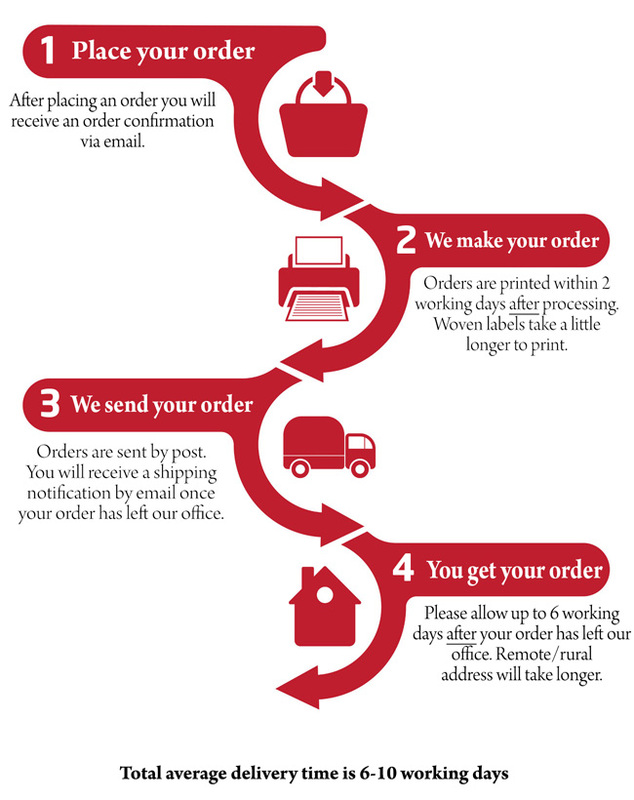 This means you don’t have to wait around for a courier or worry it might arrive while you are out. We pack our labels so they fit in a regular sized envelope and include an invoice and one of our lovely brochures. International orders are welcome. Some destinations will qualify for free shipping. We have an express service that is signature only. No PO Box for delivery. It should arrive 3 - 5 working days after sending your order. (Allow 1 - 2 days also for printing ) Guaranteed tracking. You will receive a personal email letting you know the expected delivery time and the consignment number, once it is on the way.